The Book Sale Starts Tomorrow! We are almost ready to go! 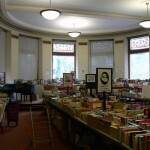 We have thousands of books all priced and organized into sections. 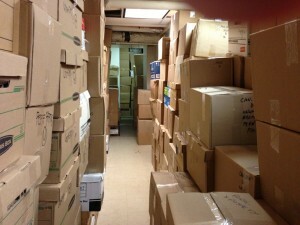 Our storage space is packed with boxes of books, records, and other treasures up to the ceiling! 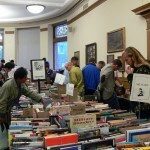 The 2013 Vic Book Sale will run from Thursday, September 19 until Tuesday, September 24 at Old Vic, 91 Charles St. W. (Museum Subway Station). All proceeds go to Victoria University Library. 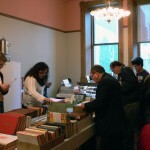 Are you as excited as we are about the upcoming book sale? In little over a week, we will have thousands of books in a variety of subjects and genres: history, literature, sociology, biographies, and many more, fiction and non-fiction. And this year, we will have a great selection of vinyl records. 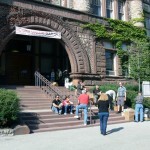 Our final preparations are already underway and will continue until the beginning of the book sale! Remember to visit our rare book room, where you will be able to find amazing treasures: leather bound sets, small and private press books (e.g. the Golden Cockerel Press), Folio Society items, and some fantastic ephemera with beautiful typography (cards, manuals, advertisements)â€”from the Victorian era to the twentieth century.